Could this be the place? 2024? This must be a picnic for kids much, much, muuuuch older than my 5-year-old. I glanced around the park, hoping to spot another group. “Give me a minute to do the math even though you were born in 2000 and I should know it off the top of my head.…..2018. You’re the class of 2018.” That couldn’t be right either; I think that’s when my New York Magazine subscription expires. None of the kids at the mixer though, seemed to be mixing. Zach would not leave his dad’s or older brother’s side as much as Jake tried to shake him. A lady by the watermelon pointed at her two boys. That soon-to-be kindergartener had suddenly taken a keen interest in watching over his toddler brother, shooing away any other kids who happened by. A darling little girl skipped past, and I called Zach over. Hoping to benefit from the experience of my 2018 graduate’s elementary school years, I knew this was no time to be shy. These other grown ups? The ones trying to calmly manage premature cookie intake and facilitate introductions of kids who would rather squeeze their eyes shut and make fart noises with their mouths, than say “hello?” These are our new classmates. We are going to be chaperoning field trips to the wildlife museum, setting up book fairs, and lamenting homework and eye rolling with these people for years. I went in with both guns ablazin’, introducing myself to anyone who even glanced in my direction. I think maybe a couple of them were there for some soccer thing, and not in fact to fete the class of 2024, but by golly, I was going to be nice in case I got to see them again at Back to School Night or in the frozen foods section at Safeway. Fortified by half eaten hot dogs, juicy watermelon and chocolate chip cookies, the little kids finally started to acknowledge each other, playing chase, up and down the slide and around the tree. Jake would intermittently join in the chase games, and then sit moodily on top of the play structure until finally one of his buddies showed up — another older brother. The two big guys loped joyfully away to play Frisbee and take advantage of their well developed hand-eye coordination that, unlike their smaller playmates, would allow them to actually catch the Frisbee. Back on the playground, the little boys outnumbered the little girls 3 to 1, though the girls outstyled the boys something fierce. Dressed to impress, they came ready to mix in bows, sundresses, and sparkly accessories – all of which were now covered in watermelon drippings. Big ups to the girl in the tiara and chocolate mustache. The gaggle of stick-wielding, sticky faced boys provided a glimpse into the future – Comic-Con 2026, to be exact. The 5-year-old fanboys made their allegiances known through their T-shirts. Soon the unwieldy yelling, chasing and unabashed snacking, gave way to little kids looking for a comfortable place to sit down, or in some unfortunate cases, lay down. The parents exchanged information on smart phones, plucked dirty picnic blankets from the grass to leave, and then their dirtier, sweaty crumpled children. 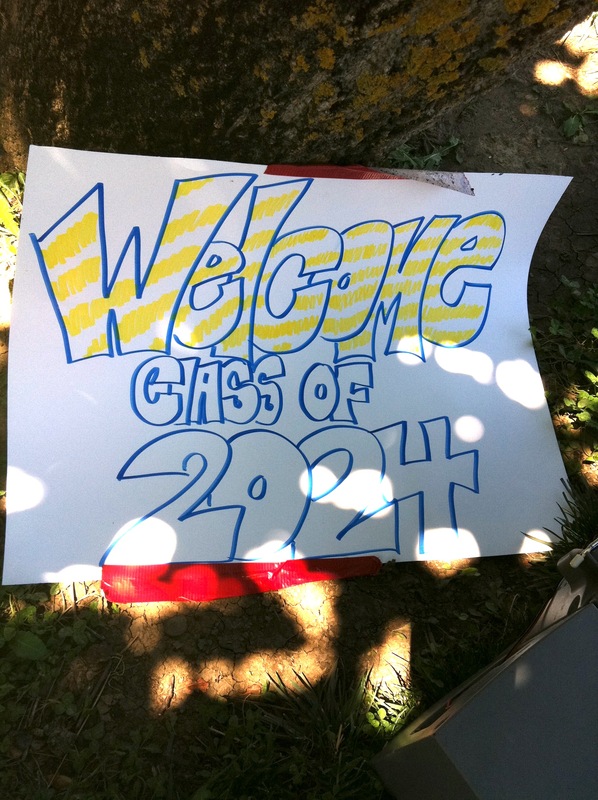 The Class of 2024 sign had fallen from its spot on the tree into the dirt. “What did you think, Zach?,” we asked as he rested his head on his car seat. Jake shook his head and stared out the window. He’d looked huge to me today, towering over Zach and his new best friends. I realized at that moment, that this big kid started kindergarten practically yesterday, just a few precious days before the birth of his brother, and this coming week he would be in the same boat as Zach –one of the younger, shorter, less experienced newbies on campus. He’s registering for middle school. 6th grade – the kindergarten of teenagers, complete with fanboy T-shirts, sparkly accessories, and awkward introductions, but perhaps with fewer fart noises (fingers crossed!) and more cell phones. Wish us luck. I love your writing, Colleen. Keep ’em coming! Thanks so much Doug! I’m looking forward to YOUR next post! It was like I was there with you. Yet you seem so calm. I think I might cry when Justin hits kindergarten! And when did 6th grade become jr high. You and I were safe at elementary school in 6th grade. Thanks Shannon. If it helps, I’ve been freaking out *a little* on the inside. Oh my gosh….I know! 6th grade is still little to me for middle school! There is a big difference between a 6th grader and 8th grader. Lord help me. Thanks so much for reading and taking the time to leave such a nice note. Justin is at such a cute fun age….enjoy! I so relate! I forgot Rowan is the same age as Zach, and our “mixer” is the Chinese folk dance class. T-shirt allegiances? heck yes! Particularly if the other kids speak Chinese. I am a firm believer now that superheroes are a universal language. I’m sure you’ll make fast friends with the other moms – your razor wit and graciousness can’t be ignored :). Haha! This calms my nerves about the whole affair…so so much… Thank you for your kind note and I can’t WAIT to see pix of your little man at school.. Seriously, thank you for taking the time to read and leave me a note! I’m dropping you a quick follow up note offline in the am as well re dates! Thank you again, my friend!